Creative, Compassionate, Courageous... We bring out the best in boys. Both of our boys love the school so much they wish they could sleep at PASH! When we arrived here in second grade, our son was immediately welcomed, felt special and had fun every day. At the pumpkin Reading Harvest, he won the largest pumpkin and I will never forget the look of pure joy on his face. The strength and warmth of the community are amazing! The all-boys education along with the nurturing and wellness of the whole child can't be found anywhere else! To be honest, you don't know what your son is missing from school until you experience Princeton Academy. It is such a gift to be surrounded by families that share similar values of respect, kindness, integrity and a desire to have nothing but the best for our sons. You cannot appreciate the opportunities they are given until you have a chance to experience them firsthand. The main thing that sets Princeton Academy apart from other schools is the importance of teaching morals and values. This is a character building opportunity at a critical age, and I personally find that to be of utmost importance, in addition to receiving a good education. This is what I value most at PASH. I value the atmosphere that is cultivated for our boys to learn. This begins with the headmaster, the head of lower school, head of middle school, to the teachers, administration and staff - all these facets of people have a genuine care and concern for our boys. The boys are allowed to express their thoughts and participate in a non-judgemental atmosphere. The teachers and staff also serve as role models to the boys, which is awesome! Middle School athletics, which give all students the opportunity to participate in an after school sport, even if they've never played that sport before, four days a week. We also value the fact that most coaches are also teachers who serve as great role models and get to know the boys on and off the field. What I value most about Princeton Academy is the focus on developing my son's character in addition to providing a high level of academics. 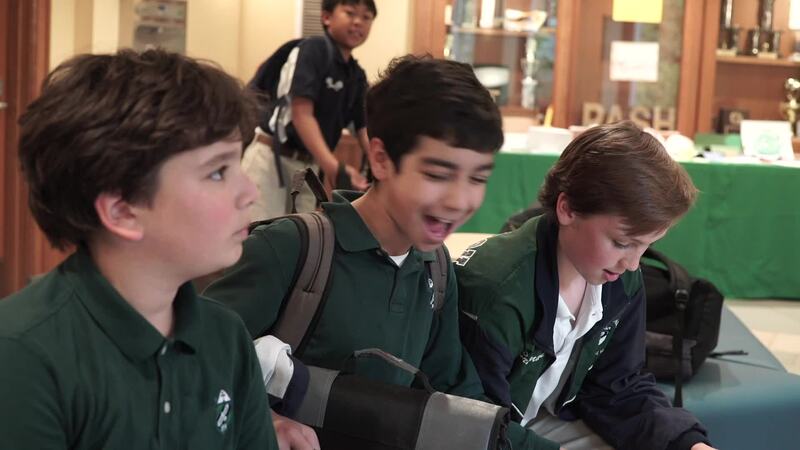 Being a Sacred Heart school adds a deeper level of spiritual growth that expands beyond the school day and is applied in everyday life. Our son is becoming a gentleman right before our eyes! It is truly what makes Princeton Academy unique and very special! My son is known personally by his teachers and celebrated for the unique gifts he brings to the school. He is encouraged in a caring community that lives out the goals that anchor my son's learning. He is challenged academically and helped to find success in every endeavor. He is greeted every morning by the Head of the Lower School with love and enthusiasm that sets the tone for the rest of his day. He is part of a true community that cares for each boy and is interested in the growth and development of his mind and character. The experience my son is getting at this school is clearly good for him. Princeton Academy has made him a more thoughtful, inquisitive, and respectful young man. I love watching him thrive there. We had trouble envisioning what could be better than the Princeton public school our boys used to attend until we learned about Princeton Academy. There is just something about the leadership, goals, and curriculum at Princeton Academy that truly inspired us to send our sons there as they continue to move through their educational journey. For the last seven years, my son has jumped out of bed in the morning because he cannot wait to get to school. His teachers and coaches have shown him how to be a responsible citizen and they make learning fun. The Sacred Heart values have become part of his fiber and we are confident that they will serve him well as he navigates his life. Please complete the form below to register for one of our upcoming free Information Sessions.